Screen shot of Realty Commander Mobile app from iTunes. Elk Software is now offering a mobile version of its paperless transaction management software, Realty Commander, for the iPhone and iPad devices. 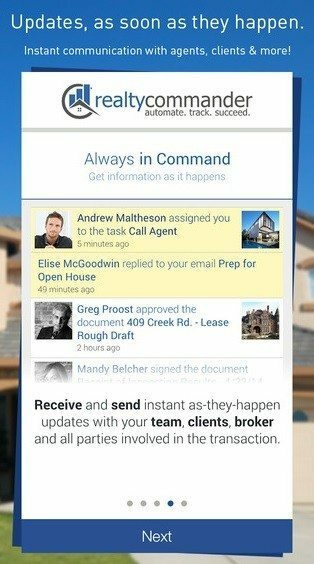 Although Realty Commander Mobile is free to download, exclusive features that are available only to “premium” (paid) users include desktop and laptop access, unlimited files and storage, broker automation and compliance, client guest access, and integration with DocuSign and Zillow. Realty Commander is a Web-based platform that enables users to manage listings, leads, showings and short sales. Ann Arbor, Michigan-based Elk Software says more than $4.5 billion in real estate transactions have been managed using the desktop version of Realty Commander.